Cats, like humans, need to exercise regularly to stay healthy. Also, like humans, they need to have fun to be happy. Fortunately, nowadays, one can find some clever contraptions that can offer your cats both activity and good times. The best and most popular of these are cat trees and cat wheels. Cat wheels are great for cats that need more activity than the average cat (such as Bengals and Siamese) who need some safe outlet for the energy that could otherwise manifest in undesirable destructive ways, such as clawing and scratching at the furniture. The idea is simple, but ingenious: a large wheel stands on a base equipped with four small rollerblade wheels, the cat gets inside the large wheel and starts running forward making the wheel rotate in the reverse direction on the tiny rollerblade wheels. Note that while cat wheels are not for every cat, most cats, with some patience, persistence and knowhow, can be trained to use and enjoy them. This article will describe in detail Go Pet Club Cat Tree Condos and One Fast Cat Exercise Wheel cat play & exercise furnishings. Selected Cat Play and Exercise Accessories on Amazon. ​Acquiring a ​Go Pet Club cat tree will greatly participate in promoting the health of your cats. They will be able to climb up and down, all the while execising and having fun. They will also be able to scartch at the sisal rope wrapped posts of the tree instead of using your furniture to do so. The cat tree will become a true home for your pets, where they will be able to jump, climb, scratch and even sleep safely. It will be a little bit like their own special place. Moreover, the Go Pet Club cat tree can become an element of your interior decoration: some have very original shapes and are designed with high quality materials that you will not be ashamed of displaying in your living room. Even if the initial purchase has a certain cost, you'll be able to avoid purchasing other cat accessories later, such as cushions, scratch boards, etc. More over, your cat will no more need to climb on your bed or hide under it to snuggle and leave hair and other unwanted stuff! Overall Size: 42"L x 23.5"W x 87.5"H.
3 Big Condo Houses Size: 19.25"W x 14"L x 11.75"H .
2 Condo Houses Size: 12"W x 12"L x 10H . 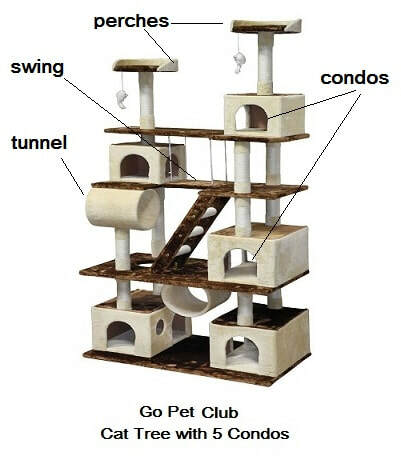 Size of 2 Top Perches: 13.25"Dia x 3"H .
Size of 2 Tunnels: 10"Dia x 12"L .
​This specially designed Go Pet Club cat tree features 5 condos, three large and two medium sized, for your cat's enjoyment. It also comes with two large tunnels and perches (platforms) that provide plenty of room for your cats to relax. The perch in the middle of the cat tree also serves as a swing, which gives your cats a place to play. It comes with two mice, a ladder, and platform holes to provide your cat with hours of entertainment! ​As shown in the picture above, the cat condos on this tree are large enough for the cats to go in and rest or sleep in their own private place. In addition, the perches (platforms) are high enough to give the cats plenty of exercise for climbing up and down, and they are are wide enough to allow the cats to rest or sleep on them, when they don't want to sleep inside the condos. The Go Pet Club tree chosen here is one of the largest the manufacturer makes, but smaller ones with similar features and fewer condos and perches are also available and can be found in the Amazon section below by clicking here: Selected Go Pet Club Cat Trees on Amazon. 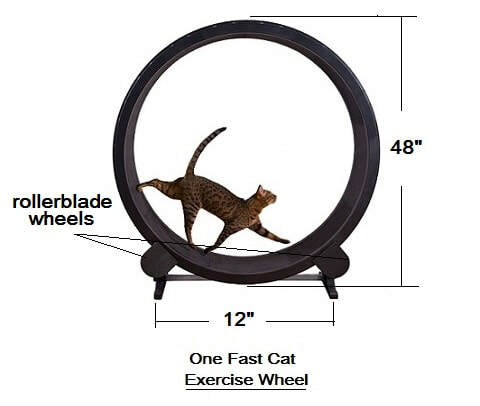 The One Fast Cat exercise wheel is quite different from the Go Pet Club cat tree described above. Though, it does not come with cat condos and perches, it provides the cat with the possibility to reach much higher levels of activity, as the cat can literally race on the wheel attaining high speeds. This clever contraption gives cats a safe outlet for built-up energy that would otherwise could manifest in some unwanted behaviors. Being entirely cat-driven, the wheel needs no batteries or power source, and it can be used by the cat without any assistance. ​Note that as cats do not have a natural instinct to run on a wheel, some training will be required. But once your cats learn how to use their new toy, they'll hop on it throughout the day, usually going for a quick sprint or two every few hours. In addition to burning off excess energy, the wheel can help your cat burn off extra calories, too. Though it may take longer and more effort to get heavier cats running on a regular basis, once they get the knack of it, you may start noticing them gradually slimming down. According to the manufacturer, the wheel was designed for cats up to 25 lbs and was tested with 30 lbs weights. It proved remarkably stable and had no problem supporting the weights. But the recommended limit is 25 lbs. The manufacturer also specifies that the wheel can be used on hard floors and on some carpeting. However, if the carpeting is too thick, or soft, this can reduce the stability of the wheel. In such situations, wood slates can be placed under the wheel to offer a uniform, stable surface for the wheel. Run surface is made from a closed-cell EVA foam to prevent claws from catching and allowing cats to run naturally using their claws for safe footing. It has an open design so cats can enter from either side. Rollerblade wheel covers included free of charge. What is the energy level of your cats? If they have a moderate to high energy level, then the wheel will be good for them to be able to expend some of that energy. An example of moderate to high energy is if the cat is inclined to race through the house in short spurts. Are your cats trainable.? A good way to test this is to see if you can get your cat to jump up and down from a chair with the use of a toy or treat as incentive. Some customers have had their cats take to the wheel immediately without prior exposure to a cat exercise wheel. Others have gotten their cats walking on the wheel with an incentive of a treat within the first few days. However, for most cats, it takes time and patience to get them to start using the wheel. It can take a couple weeks, sometimes even a month or more of daily training, before cats start using the wheel on their own. ​To give you time to work with your cat on the wheel, the manufacturer allows returns on these wheels for up to 60 days after receipt. If the wheel just doesn't work out for your cat, you can contact the manufacturer to start a return. Please be aware that they provide a $150 refund on used wheels (the remaining $49 goes towards recouping shipping fees and replacing parts that cannot be reused) and that we do not provide pre-paid ​return labels. For exact price information on the One Fast Cat Exercise Wheel please click: One Fast Cat Exercise Wheel on Amazon. ​So which of the two cat play & exercise accessories to buy? Clearly, the two cat exercise accessories described here serve quite different purposes. If your home already has a place your cats can call their own, where they can play, rest, sleep, hide away and exercise, you may not need to get a cat tree, but might want to consider the cat wheel so they can get more exercise, specially if they are overactive cats needing to spend their energy or chubby ones that need to lose some weight. On the other hand, if you don't already have that special place your cats can call their own, where they can play, rest, sleep, hide away and exercise, you should definitely consider getting a cat tree. Not only will it make your cats happier, but it will also protect your furniture from getting damaged by undesirable cat behaviour (such as scratching) as the cats will prefer doing their scratching and all other "cat business" in their own little place built in a way that is adapted to cat behavior. ​However, if you can afford it, there is nothing wrong in getting both a cat tree and a cat wheel, as you would be providing your cats with all the benefits of both ingenious contraptions.